BuckAround contributor Neal Olson (@olewr7) wraps up his preview series - how will it go for the Badgers this year? Find out below . . . The Paul Chryst regime will begin with a bang this Saturday in Dallas against Alabama. Depending on your proclivity for optimism, this is either the best or worst way to start a new coaching era. While most top 25 teams will be cashing big checks with home games against directional universities, the Badgers get a first-rate opportunity to test their mettle against one of the big boys of college football. Without putting too much emphasis on a single game, the outcome in the opener is likely to skew Wisconsin football fans on the potential of the program under Chryst. A victory will skyrocket Chryst’s status in the state, with legitimate and well-earned playoff talk likely to follow. A loss probably won't tell us much (it is favored Alabama after all), depending on the lopsidedness of the scoreboard; a loss will also do nothing to dissuade some from questioning whether Wisconsin can complete at the highest level of college football. Chryst’s predecessors at Wisconsin had very different legacies when it came to individual games. Barry Alvarez was a master at preparing and winning (usually) games against higher-ranked teams, specifically bowl games played in Pasadena. However, Barry’s teams had a penchant for losing games they were expected to comfortably win, most notably in 1993 at Minnesota, and in 1999 at Cincinnati; Rose Bowl champions both, that dropped road games against unranked opponents. Bret Bielema, on the other hand, made hay destroying the bottom-feeding teams on the schedule. For three consecutive seasons from 2010-2012, the Badgers averaged 68 points with a 54 point margin of victory over Indiana for example. However, where Alvarez was at his best in the spotlight of big games, Bielema consistently fell short - he had a 2-7 bowl record at Wisconsin (and yes, he should take the lump for the third Rose Bowl loss, Barry’s still 3-0!) and beat Ohio State just once (even though the Buckeyes were #1 in 2010). 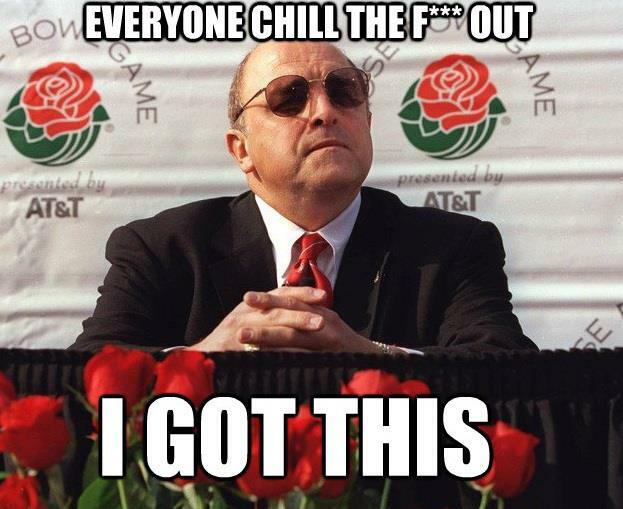 And while the two Big Ten championship games were fun, a calming internet meme will never be Bielema’s forte. As far as Chryst is concerned in 2015, we are much more likely to see how he handles games against the bottom feeders. Aside from Alabama, the Badgers should be favored in nearly every other game this season. Dave Bartoo who, runs CFBMatrix (and recently broke down Chryst and the Badgers on the BuckAround podcast), identified the Badgers' schedule as the easiest of the Power 5 conferences after week 1. In conference play, the Badgers face two road games on the road, at Nebraska and at Minnesota, which will be their biggest challenges (sorry Max, I just can’t include Iowa! [ed. note - it's ok, I understand]). Fortunately, Wisconsin has owned the Ax since the Clinton Administration and have had Nebraska’s number since the Huskers joined the Big Ten (2012 in Lincoln and Danny O'Brien notwithstanding). Winning is never guaranteed of course, but losing any of the games outside the Marquee Three ('Bama, Nebraska, Minnesota) will certainly ignite the Badger faithful - check the @JSComments Twitter feed with trepidation at that point. The three home non-conference games against Miami (OH) (not the program that was subject of TWO 30 for 30s), Troy, and Hawaii are all leading candidates for oldsters to complain about the late-arriving student section. Wisconsin shouldn't have any problems winning all three games. A good portion of the Big Ten West is in disarray. When a majority of the storylines are related to setting up a players union or firing your coach one week prior to the first game of the season, there just isn't a whole lot of fear garnered by games against those opponents. The two crossover games with the East division are Rutgers and Maryland, both expected to finish at the bottom of their division. Without completely jinxing the season, there's a good chance present day Bret Bielema could quarterback this Badger team to a winning record and a bowl game. In short, past the opener, the schedule is ideal for a new head coach hoping to win over fans. The schedule has been a focal point thus far, and rightfully so, but that shouldn't detract from a talented roster. Barry Alvarez was a believer in Lou Holtz's five outstanding player theory. The theory holds that a team needs no less than five superstars, surrounded by solid role players, to be championship caliber. With Corey Clement, Michael Caputo, Vince Biegel, and Joe Schobert, the Badgers are close to knocking on the door of that magic formula. Not only do the Badgers have playmakers on both sides of the ball, they are a relatively young team. On the initial depth chart released Monday, nine of the starting 22 players are seniors, and only 12 seniors appear in the two-deep in total. Whatever this season brings, the Badgers should be well-stocked for next season and beyond. Paul Chryst’s tenure at Wisconsin will be an interesting barometer for Wisconsin football. The past two coaches left in surprising fashion to oversee programs that should be considered lateral moves at best. Wisconsin football has long been a model of consistency. A “B+” program with an occasional “A” season sprinkled in every four to five years. Can Chryst be coach that vaults them into a bona fide playoff and national title contender? Whether this season ends up as one for the record books, or merely paves the way for future success, the #QuestForFun starts Saturday in Dallas. So ready your hashtags, enjoy the screen game renaissance, and relax. Football on Saturdays is finally back. Final Prediction: 10-2, Big Ten Title Game, New Year’s Day Bowl (probably against Bielema and Arkansas - #karma). Posted in 2015 Season and tagged with Paul Chryst, Neal Olson. August 31, 2015 by Buckaround.